JETBOY regrouped in 2010 for the EP Off Your Rocker, which marked 20 years since the Damnation album. JETBOY found themselves testing the waters, having been away and then reappearing in the digital era. The band performed some sporadic gigs but nothing that would give anyone an indication that a full-fledged regrouping would follow. Fast forward to 2017 when the core of JETBOY, which includes founding members, guitarists BILLY ROWE and FERNIE ROD and singer MICKEY FINN started working on a proper return, having landed a deal with FRONTIERS RECORDS and the project moved full steam ahead. “Beating The Odds” is a blazing track that opens the album and is harder and heavier than anything that JETBOY have done before. It’s faster with the traditional driving JETBOY groove. 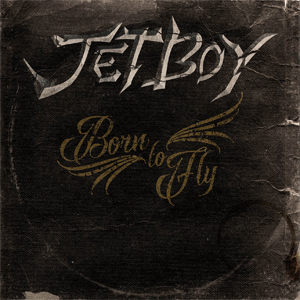 The title track “Born To Fly” is a melodic, gritty, hooky tune that is inspirational and uplifting and could be the battle cry for JETBOY in 2019. Another standout is “A Little Bit Easy” and is the only song that sounds like it could have come from Off Your Rocker, which had a very classic AEROSMITH feel to it. On “A Little Bit Easy” FINN even gives a Steven Tyler-esque performance, which is sure to get a rise from fans. There’s no clunkers on the album and the sequencing is brilliant. I can’t say enough about the ballad “The Way That You Move Me”, a bluesy tune that is a throwback to something that could have come out of the 70s. It has a ‘Stonesy’ vibe, which you’ll pick up on within seconds. All in all, Born To Fly is a solid effort from JETBOY who have come out of nowhere with a well written record, close to 9 years removed from their last studio recording. It’s incredible how some bands from the 80s are cranking out some of the best albums of their career. It defies logic, and now we can include JETBOY in that conversation.